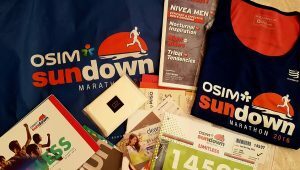 OSIM Sundown Marathon 2016: What's In The Race Pack? | JustRunLah! The race pack collection at Suntec City Convention Hall has already ended. Taking up a total of 2 exhibition halls, the site of the race pack collection housed several different sponsors that have set up various stalls much like what you would see in an IT fair. Several items were sold at a discounted price specially for the participants for the marathon. That is pretty much everything in the bag, not counting the extra pamphlets and some freebies you might receive from the exhibition as you make your way to the exit. The race will be held at F1 Pit Building on 28th May 2016.